Ottawa homeowner Cory Porter was dumped by his insurance company after Porter wanted to repair cracks in the foundation of his South Keys home. An Ottawa homeowner says his insurance company cut ties with him because his home's foundation cracked after tree roots sucked moisture from the clay underneath. Two trees were so thirsty during this summer’s drought, their roots burrowed under Cory Porter’s house causing the damage, according to an inspection of the foundation. Porter discovered the cracks in August after returning from a vacation and he reported the matter to his insurance company, The Dominion of Canada General Insurance Company, which inspected the home. "We told the insurance company about the problem and made it pretty clear we were moving to have it fixed," Porter said. "Then boom, out of nowhere, they cancel our policy. We’re in shock and disbelief." Porter received a notice of cancellation in the mail from the company, which declined a request for an interview. The Insurance Bureau of Canada said insurance companies have the right to cancel policies whenever they see fit. 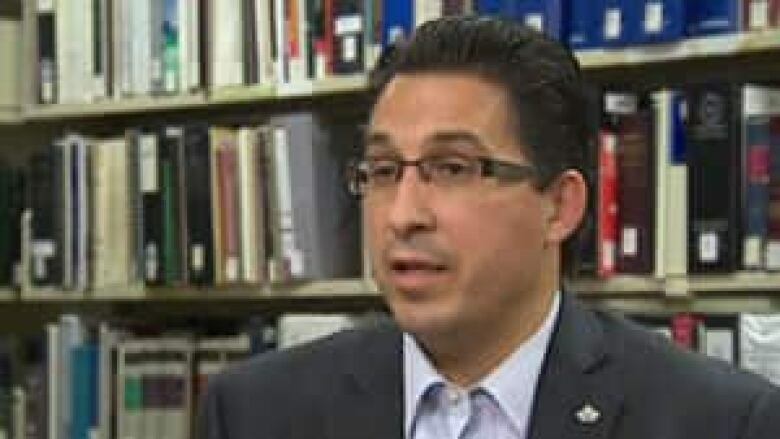 Pete Karageorgos, an industry and consumer relations manager based in Toronto, told CBC News if there is a change in risk to a home and the insurer was not made aware of it, they can cancel the contract. "Insurance is really a contract. It's a contract between the customer and insurer, so each party has responsibilities," Karageorgos said, adding homeowners need to maintain the home to a certain standard. "There are times where people don't read the specifics of the policy or don't have a conversation with the broker to fully understand what's in their policy, what some conditions are." Porter, who has lived in the 33-year-old home for six years, cannot depend on insurance to pay for repairs. But one of the trees responsible for the damage belongs to the city and he could seek compensation from the municipality. "If the city tree was a contributing factor then there is a claims process and the city will assist in covering the costs," said Diane Deans, councillor for Gloucester-Southgate. Porter said the cost of the damage is between $20,000 and $30,000.